Saturn'ssmoggy moon Titan has hundreds of times more natural gas and other liquidhydrocarbons than all the known oil and natural gas reserves on Earth,scientists said today. Thehydrocarbons rainfrom the sky on the miserable moon, collecting in vast deposits that formlakes and dunes. This much was known. But now the stuff has been quantifiedusing observations from NASA's Cassini spacecraft. "Titanis just covered in carbon-bearing material — it's a giant factory of organicchemicals," said Ralph Lorenz, a Cassini radar team member from the JohnsHopkins University Applied Physics Laboratory. "This vast carbon inventoryis an important window into the geology and climate history of Titan." At? minus179 degrees Celsius (minus 290 degrees Fahrenheit), Titan would be an awfulplace to live. Instead of water, liquid hydrocarbons in the form of methane andethane are present on the moon's surface, and tholins probably make up itsdunes. The term "tholins" was coined by Carl Sagan in 1979 todescribe the complex organic molecules at the heart of prebiotic chemistry. Titan haslong been viewed as a place that might be somewhat like Earth just beforebiology got going. Cassini hasmapped about 20 percent of Titan's surface with radar. Several hundred lakes andseas have been observed, with each of several dozen estimated to containmore hydrocarbon liquid than Earth's oil and gas reserves, according to a NASAstatement. The dark dunes that run along the equator contain a volume oforganics several hundred times larger than Earth's coal reserves. Provenreserves of natural gas on Earth total 130 billion tons, enough to provide 300times the amount of energy the entire United States uses annually for residential heating, cooling andlighting, according to the release. Dozens of Titan's lakes individually havethe equivalent of at least this much energy in the form of methaneand ethane. "Thisglobal estimate is based mostly on views of the lakes in the northern polarregions," Lorenz said. "We have assumed the south might be similar,but we really don't yet know how much liquid is there." Cassini'sradar has observed the south polar region only once, and only two small lakeswere visible. Thefindings are detailed in the Jan. 29 issue of the journal Geophysical ResearchLetters. Scientistsestimated Titan's lake depth by making some general assumptions based on lakeson Earth. They took the average area and depth of lakes on Earth, taking intoaccount the nearby surroundings, like mountains. On Earth, the lake depth isoften 10 times less than the height of nearby terrain. "Wealso know that some lakes are more than 10 meters or so deep because theyappear literally pitch-black to the radar. If they were shallow we'd see thebottom, and we don't," Lorenz said. Thequestion of how much liquid is on the surface is an important one becausemethane is a strong greenhouse gas on Titan as well as on Earth, but there ismuch more of it on Titan. 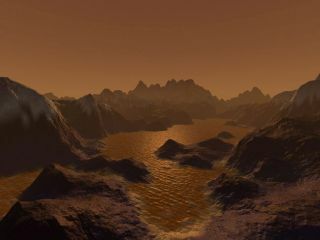 If all the observed liquid on Titan is methane, itwould only last a few million years, because as methane escapes into Titan'satmosphere, it breaks down and escapes into space. If the methanewere to run out, Titan could become much colder. Scientists believe thatmethane might be supplied to the atmosphere by venting from the interior in cryovolcaniceruptions. If so, the amount of methane, and the temperature on Titan, may havefluctuated dramatically in Titan's past. "Weare carbon-based life, and understanding how far along the chain of complexitytowards life that chemistry can go in an environment like Titan will beimportant in understanding the origins of life throughout the universe,"Lorenz said.